Embark on a tasting tour of Italy with this trio of celebrated Italian wines including pinot grigio, chianti and Toscana red. 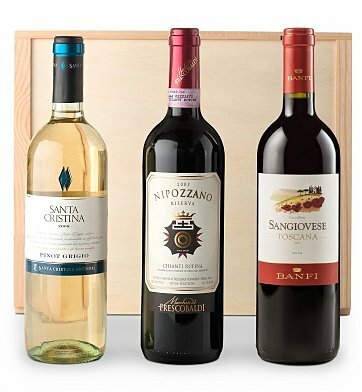 One bottle each of Santa Cristina Pinot Grigio, Nipozzano Chianti Reserva, and Banfi Collepino Sangiovese Toscana. For more information on this wine, please see the Tasting Notes. This trio of fine Italian wine is presented in our enduring signature wine crate. A complimentary card is included with your gift. Personalize It! The lid of this wine crate can be custom engraved with the personalization of your choice - up to 5 lines, 58 characters per line. Measures 14" x 12" x 5"
if ordered by 3:00 pm EDT Tuesday April 23rd. Italian Wine Tour is a hand delivered gift. These gifts are delivered by one of our local design centers located throughout the United States and Canada. Same day delivery is available for most gifts when ordered before the cutoff time. The cutoff time for Italian Wine Tour is 12 PM in the recipient's time zone. Antinori Santa Cristina Pinot GrigioA lively welcoming wine from one of Italy's most prominent makers. Frescobaldi Nipozzano Chianti Rufina RiservaA Sangiovese showpiece with shimmering acidity and a wonderful slow-burning finish. Banfi CollePino Sangiovese ToscanaRuby red, young but intense. Fresh, fruit-forward, with intense red currant, raspberry and plum notes. Ruby red, young but intense. Fresh, fruit-forward, with intense red currant, raspberry and plum notes. Full fruit flavors with soft, sweet tannins. Nice finish. Pairs wonderfully with a wide range of food and is suitable for any occasion. Ideal with red and white meats as well as cheeses. A long-finishing Sangiovese showpiece at its peak, the excellent Nipozzano Riserva greets you with deep purple hues and aromas of dried plum and sour cherry to match. Spicier impressions of black pepper and espresso beans appear in the warming mid-palate and stay for the slow-burning conclusion boosted by a positively shimmering acidity. A lively, pleasantly fruity wine from Antinori, Italy's single best-known wine producer with over 600 years of history. Pours straw-yellow with aromas of peaches and ripe apples. Eminently drinkable, with bracing acidity balanced by a welcoming sweetness. Three world famous Italian wines: pinot grigio, chianti, and Toscana red. Presented in GiftTree's enduring signature wooden wine crate.